Having good products or services is the main strength of any successful ecommerce business. But the presentation and usability eCommerce also play a significant role. A beautifully designed site will certainly attract your customers. But that alone is not enough to increase your online sales. Let the users buy items as guests. In other words, don’t make signing in or signing up a mandatory part of the checkout process. A 2016 survey of US adults shows 35% of potential customers may abandon cart if they can’t checkout without creating an account. Keep a clear distinction between the sign in and sign up forms. It’s frustrating for new visitors if they try the sign in form to create new accounts. Have a show password option in the log-in form. Many visitors use mobile devices to access your site. So it’s very common to have typos while entering passwords. Make your checkout process as simple and easy as possible. 27% potential customers leave your site if they encounter a complicated checkout process. Use a top bar to show how many steps a customer needs to take for completing the checkout. Establishing trust is a crucial factor for any eCommerce site. If customers can’t trust you with their credentials, your online business prospects are essentially doomed.Use HTTPS on your eCommerce site. Customers will appreciate that their information is going through a secured channel. In addition to that, Google considers HTTPS to be a ranking factor. Include trust badges is the best way to convince potential customers about the security of your site. The top three badges that the consumers’ trust are: Norton, Google TS and BBB. Note that, the badge provided by Norton is an SSL seal (indicating technical security), the other two are Trust seals (indicating business authenticity). But the differences between these two types don’t really matter for your visitors. You customers should never feel lost or confused on any page of your eCommerce site. Each page must display the main navigation menu, preferably at the top. Many sites also have a left-hand menu for making things even more accessible.The main menu should be as simple as possible. List only the most important and broad categories here. Make sure that you have an easily readable font and color combination. Use drop down menus if you want to categorize further. Drop down menus appear only when the user hovers on a specific category. So, it reduces the overall clutter while keeping everything easily reachable. Every eCommerce site must have a clearly visible search bar along the top. This is a mandatory feature to be included on every page of your site. According to a research conducted by Forrester and Akamai, your eCommerce site shouldn’t take more than 2 seconds to load. Even a 250-millisecond delay can make a difference between you and your competitor site.If your site speed is not up to this mark, invest on a better hosting plan. Also, you can optimize your site by reducing external scripts, using browser caches, minimizing CSS and compressing the images. If your site is large and gets a lot of traffic, then you may consider using a CDN. A CDN (Content Delivery Network) uses multiple servers in different geographical locations to store duplicates of your contents. This reduces page loading time for the users who are far away from your central location. Your eCommerce site contains a lot of information on the available products. It’s very important to present that information in a proper way.A very simple but effective way to attract customers is to use big product images. When a potential customer clicks on a product, (s)he should be taken to a product specific page that contains detailed images of that product (from multiple angles) along with related information. At all costs, avoid listing an item with poor or no product image. Your site should offer the customers an easy way to compare two (or more) products. This will help them in making purchasing decisions. If you have a big eCommerce site with a consistent list of items, consider showing reviews of previous customers on the product page. Apart from price and general details, two other essential information that a product page should contain are – Delivery time and information on Return policies. Econsultency reports that 68.4% customers want to know the delivery timescale and charges before buying a product. 46% people always check the return policies before making a purchase online. 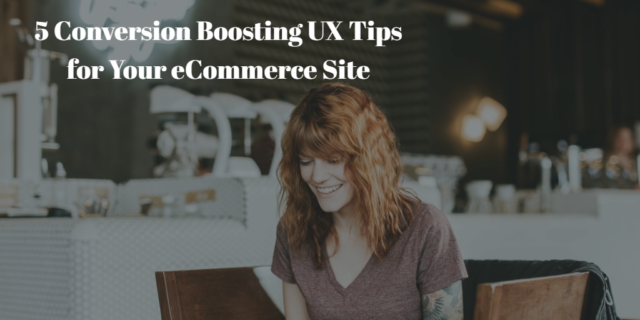 Apart from these basic ones, there are countless other ways to improve the user experience of your eCommerce site. As each site is different, you’ll often need to do practical A/B testings to figure out the which work best for you. Have you used any of the above tips to increase your eCommerce sales? Which design decisions have worked the best for you? Let us know in the comments.